Hibiscus (Hibiscus rosa sinensis) known colloquially as the Chinese hibiscus, China rose and shoe flower, is an evergreen flowering shrub native to East Asia. It is widely grown as an ornamental plant throughout the tropics and subtropics. The flowers are large, generally red in the original varieties, and firm, but generally lack any scent. Numerous varieties, cultivars, and hybrids are available, with flower colors ranging from white through yellow and orange to scarlet and shades of pink, with both single and double sets of petals. In the subtropical and temperate Americas, hummingbirds are attracted to them on a regular basis. 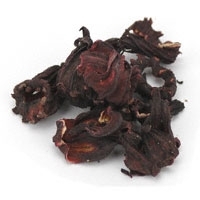 Hibiscus petals can be used in hair washes, oil infusion and vinegar rinses for the hair.